From blood-pressure kiosks in retail stores and vision exams online to home kits that test for HIV, blood-sugar levels, colon cancer, and more, the do-it-yourself approach to health screening continues to expand as the demand for greater convenience and consumer empowerment grows. Even online hearing tests are a part of the DIY mix, but do they work? What role can they play in ensuring your optimal hearing health? Let’s take a closer look, including the pros, the cons, and the bottom line for keeping your hearing in top shape. Imagine being able to accomplish anything and everything from the comfort of your own home. Sounds pretty convenient, right? 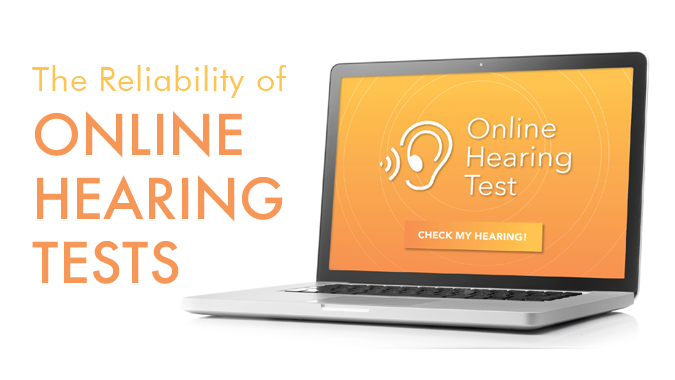 We’re not quite there on a global scale, but quality online hearing tests could help you take a first step toward better hearing health without even leaving the house. People take an average seven years to make a provider appointment after suspecting they may have a hearing loss, so imagine how much sooner they might seek professional help if they could make that first move — a hearing test — at home. It’s simple, free, discreet, relatively quick, and can potentially estimate your current hearing ability. Several online or app-based home hearing tests have been developed, and researchers have been studying how well they compare to similar tests given in a hearing-care professional’s sound booth. Results have varied, depending on factors such as the specific DIY platform tested. Some online hearing screenings may use the pure-tone air-conduction threshold test, for instance, in which each ear is played a series of sounds through earphones, and you indicate whether you can hear each respective tone. The test measures the quietest sound you can reliably hear at least 50 percent of the time — the threshold. This important data, however, only scratches the surface. It doesn’t explain how well you hear speech, how well you understand it, or whether the hearing loss is due to an injury in your ear. In addition to a battery of important tests that measure elements such as pure-tone air and bone conduction, speech and word recognition, tympanometry and acoustic reflexes, comfortable listening levels, the threshold of discomfort, and more, professional examinations include an inspection of your ears and an intake of your medical and hearing-health history. A reliable home hearing test can serve as an important wake-up call in your hearing health. If you’re on the fence about hearing care, it’s an easy way to find out whether you potentially have hearing loss, which is best addressed by a trained, licensed professional. Keep in mind, however, that a home hearing test shows you a symptom — it doesn’t pinpoint the underlying problem or provide solutions for your unique needs. An audiologic evaluation gathers nuanced data about not only your auditory system but ways to improve your specific hearing difficulties. Your auditory system is complex, and so is the combination of people and environments that creates your unique listening lifestyle. If you’re noticing difficulty communicating in your everyday activities or took an online test that indicated potential hearing loss, don’t wait. Contact our caring team for a comprehensive evaluation today.